Joanne-Marie Robinson’s thesis assesses evidence for non-royal consanguineous marriage in ancient Egypt, explores why some families married consanguineously, and investigates potential economic and biological outcomes resulting from these unions. The clinical definition of consanguinity used here is that of a biological relationship up to the level of second cousin or closer. Joanne-Marie argues that for some families, and under certain conditions, consanguineous marriage was a preferred economic strategy in terms of gifts given at marriage and in inheritance, and that families who married consanguineously may have received greater levels of intra-familial support without the expectation of reciprocity. Although there may have been adverse biological outcomes arising from recessive gene disorders in the offspring of consanguineous marriages, she proposes that these physical or cognitive abnormalities were not distinguished from other medical disorders in the general health environment of ancient Egypt. 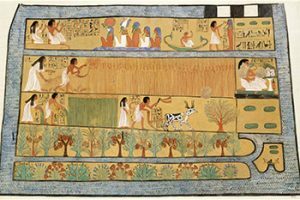 Sennedjem and Iyinofreti in the Fields of Iaru, drawn by Charles K. Wilkinson from an original painting in the Tomb of Sennedjem (TT1) at Deir el-Medina, 19th dynasty (Rogers Fund, 1930, courtesy of The Metropolitan Museum of Art, New York). the extended use of kin terms to express consanguinity, affinity and wider kinship. Although sibling marriages in ancient Egypt are attested for more than a century amongst non-royals in the Roman Period, specific references to other consanguineous marriages occur less frequently, but there are indications that consanguineous relatives did marry, particularly cousins. This thesis proposes that consanguineous marriage was more widespread in ancient Egypt than the evidence suggests and argues that it was favoured by some families under certain conditions and environments for its economic gains and associated social support networks. It is unlikely that biological outcomes arising from these unions would be associated with consanguinity or result in the exclusion of affected individuals.